How fitting that a harbourside community on the Pacific Ocean should be named after a fish. The T'sou-ke was supposedly a stickleback found in abundance in the waters around the southwestern tip of Vancouver Island - a natural resource that prompted the Salish peoples of the T'sou-ke Nation to originally settle here. 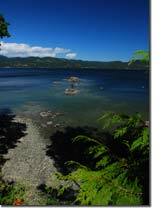 Now known simply as Sooke, the area has become famous for so much more. This tranquil refuge is relaxed rural vacationing at its finest. Whether enjoying the warm, dry summers or wet, mild winters, Sooke's unspoiled beaches, pristine forests and unforgettable vistas provide a rare and beautiful setting for either a romantic or a family getaway. Located just 45 kilometers west of Victoria, BC, Canada, this community of over 10,000 encompasses East Sooke and the District of Sooke - two regions that flank either side of the beautiful Sooke Basin. The area's heritage is steeped in logging, lumbering and fishing. Visiting the Sooke Regional Museum is a journey through its colourful past, bountiful industry and rich First Nation's history. But Sooke has also quietly nurtured a new renaissance culture of its own. Music, drama, arts & crafts - it can all be found here. In fact, beyond the glittering marinas and glowing restaurants, there thrives a culture of cottage industries as unique and magical as the place they call home. Sooke hosts Vancouver Island's largest juried art show, highlighting some of the Island's most famous artists. Numerous artisans and craftspeople open their studios and galleries to the public every year during the Sooke Studio Tour. Enjoy the Bluegrass Festival in June. Experience the All Sooke Day logger sports show in July. The Sooke Festival of the Performing Arts unites local talent with touring theatre, dance and musical companies through late July to early August. The Sooke River Music Festival kicks off mid-August. Rugged coastlines, lush rainforests, staggering views of America's Olympic Mountains -- landscapes like this aren't short on outdoor activities, either. Nine-iron heroes hit the links at several golf courses including John Phillips Memorial Golf Course, Metchosin Golf Course, Olympic View Golf Club, Royal Colwood Golf Club and Bear Mountain Golf and Country Club. Fishermen find some of the planet's best saltwater fishing in the Strait of Juan de Fuca, just off Sooke Harbour. Even mountain bikers have their choice of endless rides such as the famous stretch of the Galloping Goose Trail between Roche Cove Regional Park and Leechtown. But it's the truly unique activities that make Sooke special. Scuba divers find an unparalleled experience awaiting them at Race Rocks, where the swift currents move plankton to these tiny islets, attracting a spectacular array of marine mammals. Adventurous sea kayakers navigate the rolling waters of Vancouver Island, tackling the 60 kilometer ocean route between Sooke and Port Renfrew. Winter surfers at Jordan River ride amazing waves thanks to storms originating in the Gulf of Alaska. Sooke adventuring comes in family-size, too. The popular natural wonder that is Sooke Potholes Provincial Park is comprised of a system of swimming holes, perfect for a hot summer day. And for something the kids won't ever stop talking about, try the Eco Adventure Tour in the Sooke Hills. This educational treetop adrenaline rush features 8 zipline crossings, 2 suspension bridges and plenty of gleeful screams! Sooke's beaches are some of the most beautiful on the Pacific West Coast. The family recreation area at French Beach Provincial Park promises not only a beautiful day out but also the possibility of a sighting you'll never forget, as this is a favourite feeding ground for migrating gray whales! A trip to China Beach is precursored by a 15-minute walk through a fantasy-like rainforest before finally arriving at the wide sweep of sand. See if you can find the hidden waterfall. Just follow your ears. Likely, Sooke is most famous for its hiking trails - endless kilometers of beautiful treks that attract not only visitors but also city-folk from Victoria in need of a breather. Whether walking, biking, rollerblading or horseback riding, The Galloping Goose Trail is 100 picturesque kilometers connecting Sooke to the communities of View Royal, Colwood, Langford and Metchosin. Beginning at China Beach, the Juan de Fuca Marine Trail is a challenging 47-kilometer shoreline hike through the forest, ending at Botanical Beach in Port Renfrew. The Kludahk Forest Recreation Trail is a 30-kilometer trek running along San Juan Ridge from Sooke to Port Renfrew - a popular winter outing for snowshoe enthusiasts and cross-country skiers. 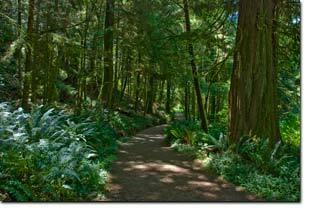 Spend the entire day roaming the 3,512 acres of East Sooke Regional Park or the 159-hectare Roche Cove Regional Park. Sooke truly has something for everyone. But what else would you expect from a place where the sea and the rainforest are best friends?